Though the Supreme Court does not have to give reason for its decision not to take a case, it noted the circumstances surrounding this one, particularly the Republican legislative leadership’s continued appeal attempts and the Democratic governor and attorney general decision to let it stand. 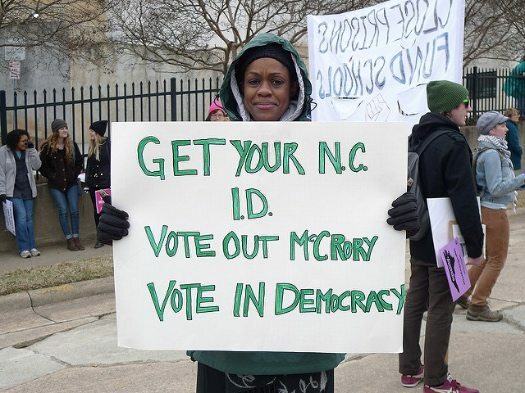 The 4th Circuit on July 29 agreed with allegations from the Justice Department and civil rights groups that North Carolina’s bill selectively chose voter­-identification requirements, reduced the number of early­-voting days and changed registration procedures in ways meant to harm African Americans, who overwhelmingly vote for the Democratic Party. The appeals court did not allow the law to be used in the 2016 election, and voters replaced the state’s Republican governor, Pat McCrory, with Democrat Roy Cooper. Cooper and the state’s new Democratic attorney general, Josh Stein, told the Supreme Court they did not want to appeal the lower court’s decision that the law violated the Constitution and the Voting Rights Act. Civil rights groups celebrated. “This is a huge victory for voters and a massive blow to Republicans trying to restrict access to the ballot, especially in communities of color,” said Democratic National Committee Chairman Tom Perez. Under the Wisconsin law, voters must present a driver’s license, state ID, passport, military ID, naturalization papers or tribal ID to vote. A student ID is acceptable only if it has a signature and a two­-year expiration date. Those who do not have their ID can cast a provisional ballot that will be counted only if they return with the proper ID within a few days of the election. By one estimate, 300,000 eligible voters in the state lacked valid photo IDs heading into the election; it is unknown how many people did not vote because they didn’t have proper identification. This could be a national problem. A survey conducted by the Brennan Center in 2006 estimated that while as many as roughly 21 million voting-age U.S. citizens did not have valid government-issued, photo identification, an additional 4.5 million had a valid ID but one that did not have their current name or address. Supporters of voter ID laws say that prohibiting out-of-state driver’s licenses reduced the possibility of voter fraud and individuals filling out multiple ballots. Research has shown that such voter fraud can happen, but it’s very rare. Looking past the debate to the results of these rulings, we see that Trump won both North Carolina and Wisconsin. Overall, nearly 3 million people in Wisconsin voted last November, about 91,000 fewer than in 2012. Milwaukee, a power center for Democrats, reported that 41,000 fewer people voted there in 2012…Backers of the ID law say that it was a success. Cyndi Suarez is a Senior Editor at NPQ. She is the author of "The Power Manual: How to Master Complex Power Dynamics," in which she outlines a new theory and practice of power. She has worked as a strategy and innovation consultant with a focus on networks and platforms for social movements. She studied Feminist Theory and organizational development for social change. In the 2018 midterm elections, American Indian turnout in North Dakota hit record levels. But doing this required a massive effort to mobilize and counter policies, such as hard-to-access voting locations and stringent voter ID rules that discourage voting.